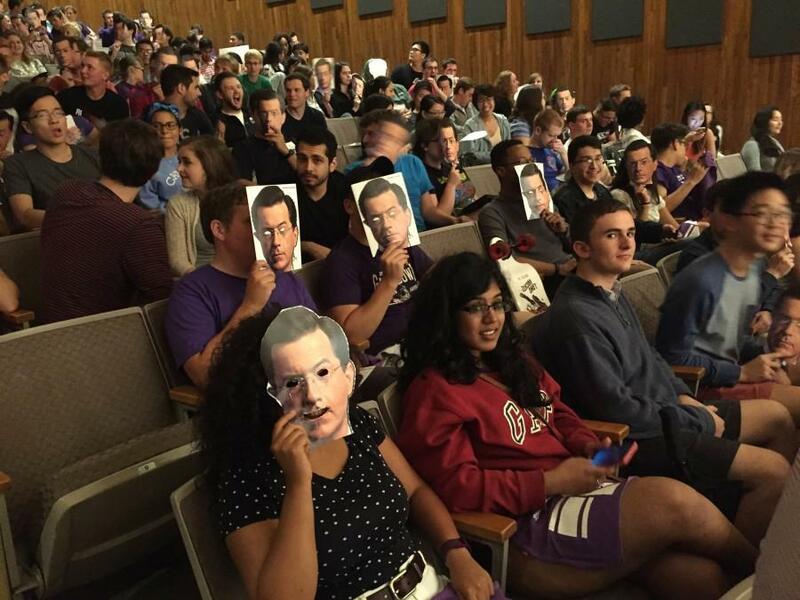 Students show off their Stephen Colbert masks at a livestreaming event of his debut as the host of "The Late Show." More than 300 people attended the event in Norris University Center. Kicking off the show with a comical montage of himself singing “The Star-Spangled Banner,” Colbert (Communication ‘86) began his reign at the post David Letterman held for 22 years. The TV personality brought back his trademark wit, rolling off one-liners on hot topics from extra-marital affair dating website Ashley Madison to the science behind Republican presidential candidate Donald Trump’s hair. NU partnered with CBS to livestream the hour-long episode, and more than 300 NU students, staff and Evanston residents gathered in Norris University Center to watch Colbert’s debut. NU students and alumni were also encouraged to use #WildForColbert on social media to show their support. Even with the start of classes more than a week away, university officials were confident that enough students were on campus to fill a screening, said James McHaley, director of student affairs marketing. Most students in attendance were either peer advisers, resident assistants or members of the Northwestern University Marching Band. Colbert’s inaugural guests were actor George Clooney and Republican presidential candidate and former Florida Gov. Jeb Bush. The new host teamed up with Clooney to treat the audience to a fake movie. Titled “Decision Strike,” the clips starred the actor as he spoofed action-thriller scenes to a dramatic soundtrack. Later, Colbert pressed Bush, his second guest, to explain what he would do differently than his brother, former president George W. Bush, if elected. Bush countered with his support to restrict Congress from spending as much as they did under his brother’s terms. Colbert previously served as the host of “The Colbert Report” on Comedy Central. In that role, he satirized a conservative anchorman reacting to current events with a narcissistic flair. The show, which ended in December, won multiple Emmy awards in its nine years.